THE Tingha community finally has certainty about its future, with a joint proposal from Armidale Regional and Inverell Shire Councils to relocate the township in the Inverell LGA being formally proclaimed today by the NSW Governor, Northern Tablelands MP Adam Marshall announced today. Mr Marshall was in Tingha this morning, flanked by Mayors Simon Murray (Armidale Regional) and Paul Harmon (Inverell) to announce that the proposal, which had the overwhelming support of the Tingha community, had been agreed to, after an extensive examination process by the NSW Office of Local Government (OLG), in accordance with the Local Government Act. Tingha and the surrounding district, an area of almost 800 square kilometres, will formally transfer to the Inverell Shire on 1 July this year, to allow for the necessary arrangements and notifications to be made. “This is very positive news for the Tingha community and both councils,” Mr Marshall said. “It provides certainty for everyone and has seen the wishes of the local community respected and granted, ensuring Tingha is part of a local government area where it’s main community of interest lies – Inverell. “This also brings to finality a process which was commenced by Tingha locals back in 2016, with the Tingha Citizens Association initiating a petition to move the council boundaries. “I want to acknowledge and thank both councils and the leadership provide by both Mayor Simon Murray and Paul Harmon and their respective senior staff during this lengthy process. The 800 square kilometre boundary change proposal was the subject of a 2016 petition by the Tingha Citizens Association Incorporated (TCAI) to alter the former local government area of Guyra to transfer the township of Tingha into the Inverell Shire LGA. The subsequent merger of Guyra and Armidale and then the inaugural election of the new council delayed consideration of the proposal. Mr Marshall said the assessment process of the proposal would have taken much longer had it not been for the work of both councils and the Tingha community to ensure the proposal was strongly supported by all parties. “This is a common-sense decision based on the common interest and connections the people of Tingha and surrounding areas share with Inverell,” Mr Marshall said. “In fact the historical links between the Tingha community and Inverell can be traced back to pre-European settlement. Inverell Shire Mayor Paul Harmon welcomed the news and said the most important factor was that the process was initiated by the community. “The process took a number of years, but through it the residents remained resolute in the outcome that they wanted,” Cr Harmon said. 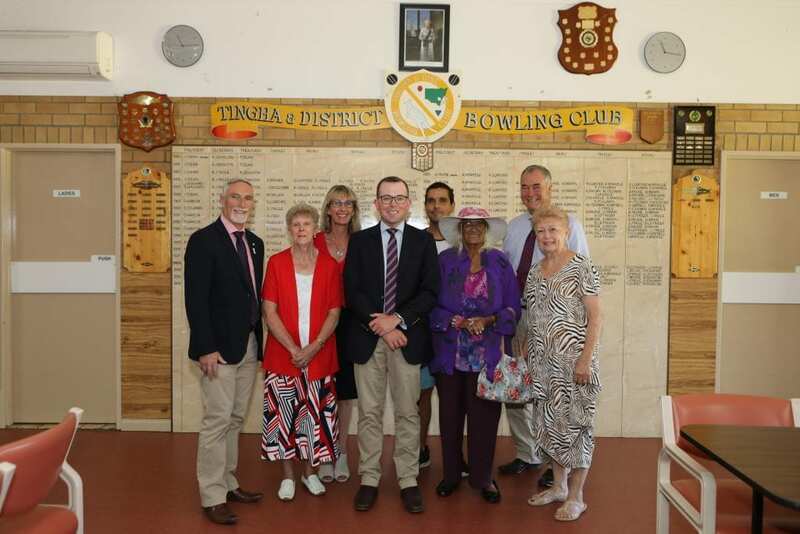 “The transfer recognises the historical, economic and social links that the Tingha area has to Inverell, and the Tingha community can now participate fully in the civic activities of Inverell Shire. Photo caption: Inverell Shire Mayor Paul Harmon, left, Tingha local and long-time Councillor Audrey McArdle OAM, Armidale Regional Councillor Lib Martin, Northern Tablelands MP Adam Marshall, Councillor Brad Widders, Tingha Elder Aunty Elizabeth Connors, Armidale Regional Mayor Simon Murray and Tingha Citizens Association President Colleen Graham at the announcement in Tingha on 8 February 2019.